On September 4, 1928, Seattle Motorcycle Officer Lyle F. Tracy was at Police Headquarters, 400 Yesler Way, and preparing to go on-duty. When Officer Tracy took his gun belt out of his locker, his pistol fell out of the holster. When it hit the floor it discharged. The bullet struck Officer Tracy in the base of the neck and grazed his spine. Officer Tracy was taken to City Hospital. He was partially paralyzed. Officer Tracy has just returned from vacation on Orcas Island. His wife, Sadie, was still on Orcas Island. Seattle Officer John Weedin was sent by plane to Anacortes where he took a special launch to Orcas Island. He notified Sadie Tracy of her husband’s injury. Officer Weedin and Mrs. Tracy returned to Seattle by plane. Officer Tracy’s condition was critical, but he had shown signs of improvement. During the afternoon of September 6, he lapsed into unconsciousness. He died September 7, 1928. Officer Tracy’s funeral was held on September 10, 1928 at St. Margaret’s Church in Interbay. He was buried at Calvary Cemetery. Lyle Florian Tracy was born in Appleton, Wisconsin on December 19, 1897. In 1906, at age 7, the family was living in Seattle. He was a veteran of WW I, having served in France. Lyle married Sadie M. McEachern on July 31, 1920. 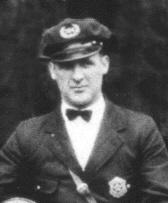 Lyle Tracy worked as a chauffeur before he was commissioned as a Seattle police officer on September 12, 1925. Officer Tracy is survived by his wife, father, and three brothers, including Irwin Tracy, a Seattle police officer.